Anglais - Site de alain-besse ! Alain BESSE is a painter of the pure imaginary. That can be seen when one follows his itinerary. Indeed, he started with a surrealist period which was, in a way, a training period. He then went on to a new era, which lasted for several years, and can be described as a mix of surrealist-like naïve style with a pinch of sci-fi. During that period, the painter grew on the technical level as much as on the level on internal resources. From then on, a little like an explorer, he engaged in paths of dreams and the infinite, leaving behind figurative representation. I would call that dreamlike abstraction. Amongst his major influences, one must mention André Verdet, art critic, poet, painter, Picasso's friend, Fernand Léger, Chagall and so many others. The latter has found in Alain BESSE's artwork the excellence and the particularities it contains. As for me, I still remember mature pieces with their atmosphere where we feel like where travelling in time. I mean a time where past, present and future fuse. Look carefully at Alain BESSE's work because through them, one can make out a secret knowledge and capture an equally secret act. The Alain BESSE pictorial works are filled with enlightened passion. The artist received as a gift this poetic freshness, the very same one which floods so many wonderful children paintings, that Jacques Prévert or Fernand Léger were so delighted to watch. Nevertheless, it would be wrong to believe that Alain BESSE artistic search is similar to the search of the naïves. I would rather say that many of his works disclose the linear purity of the primitives of olden times, and the same "credulity", the same inner enlightenment of what treasure of innocence lies hidden in some of his paintings. I believe if Alain BESSE does not let himself deviate, if he carries on with his fresh inspiration, taking all the risk of "no pleasing", he will go far in his search for pure joy. Alain BESSE reveals,in his paint, a buddling of air material, a fight of the darkness and the light which goes out always victorious. Has Alain BESSE a bestridden day Pégase and discovered in the space the visions which he offers with a transparent delicacy? Unless immovable he practises the internal journey which reveals him intimate lights which he confides us generously. 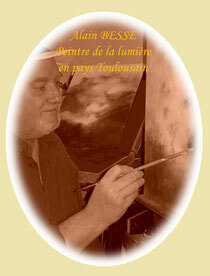 With an accomplished technique, an unstable flow, a brillant sheen, Alain BESSE creates of the dark a dreamed light. A light which reconciles opposite and dualities, for always new highlights which seem to give us meeting. Alain BESSE's poetry is that of a traveler of the soul who contemplates immovable the illumination to come. That which lasts, evolves ! Such in the paradox of demanding artists : to bring to us-beyond a confirmed style-that which endlessly reworks the material of each painting, to push back its limits, to remould its light, to the point of always getting closer to creation itself. For the philistine, Alain BESSE makes palpable this journey in which pieces coexist, always astonishingly pregnant with their dim light, with pure atmospheric effects. Turner is not far from these regions where air and water qualities, in translucent and subtly misty movements, impose themselves; active cloudism whose motions are further enriched by unpublished palimpsest scriptures... for an even more enhanced poetic surrender !